The leaders of Ukraine, France, Germany and (logically!) Russia sat together for more than 12 hours on January 11 and 12 to discuss a ceasefire amid the ongoing Russian intervention in neighboring Ukraine. In the end, a “deal” was reached in which fighting should cease – not immediately – like Merkel, Hollande and Poroshenko had wished for but after a period of more than 60 hours, precisely at midnight on Saturday night / Sunday morning. This “limited continuation” was asked for by the – not participating “rebels” and formulated by president Putin as one condition for his signature. Despite the fact that every sane person could see, this demanded prolongation of the active fighting was to create further bloodshed among the Ukrainian troops and to gain more territory – mainly around Debaltseve – until Sunday morning, it took only another 12 hours until Russian invasion forces showed what else they could “achieve” in these 66 hours, namely to create a pretext for the impossibility of the start of a ceasefire by blaming Ukraine for “massacres among the civilian population”, which demand a cotinuation of their offesnives to “save Donbas citizens from nazis”, the known Russian narrative / fake absurdity, out there since 10 months. 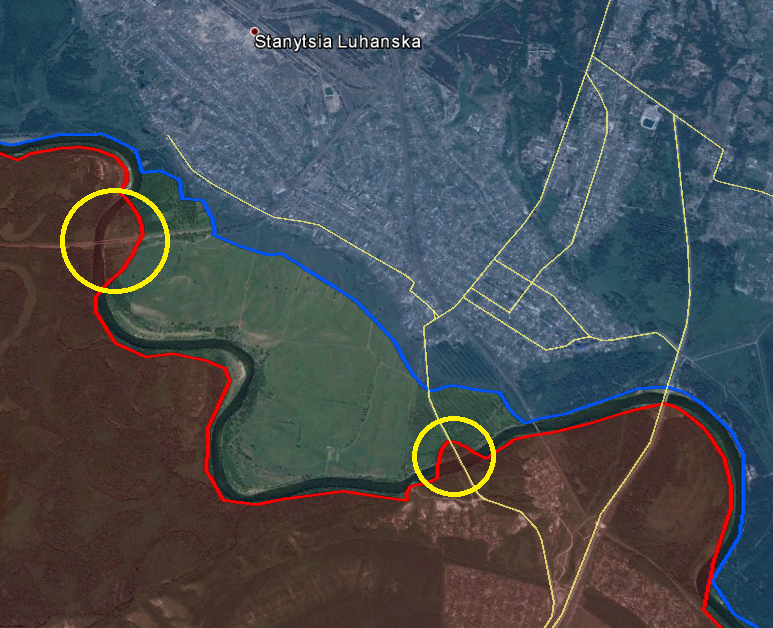 According to intelligence reports of the Militia, in order to disrupt the agreements reached in Minsk, the Ukrainian military plans a provocation with numerous victims among the civilian population at 20:00 [19:00 Kiev time] from the direction of Stanitsa Luhanska. 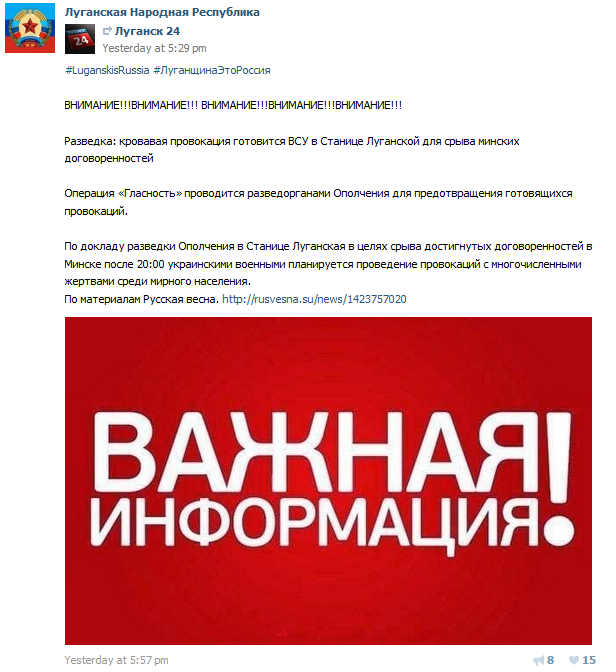 Several Ukrainian-based pro-Russian VK social network sites repeated the warning during the next minutes in what seemed to be a twing of bad conscience amid the knowledge that civilians would be targeted and killed in just a short while. The official “rebel” reasoning that “militia intelligence agencies launched an operation called >Glasnost< to prevent imminent provocations” meanwhile can be almost precluded. 1st: It is not known that Russian spies infiltrated Ukrainian units on the frontline.A warning 1 hour prior a Grad attack is thus very unlikely. 2nd: It simply makes no sense that the Ukrainian site would be interested in a continuation of hostilities as (apart from the far south) it is either holding the line or losing ground since two months, struggling to cope with a suprior Russian invasion force. 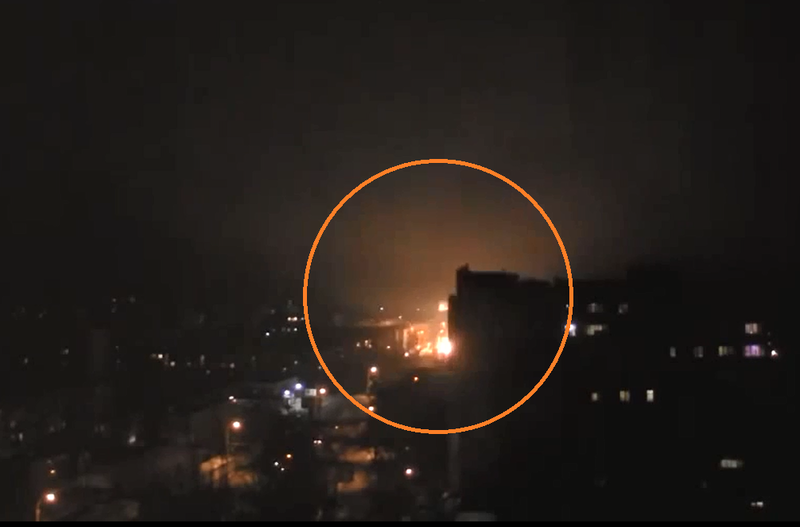 3rd: While the Ukrainian army is widely presumed to hit back at Russian artillery and MLRS positions, no matter their proximity to residential buildings, there is no proven case, it ever started a MLRS attack with such brutality and disperion on a predominantly civilian city quarter. 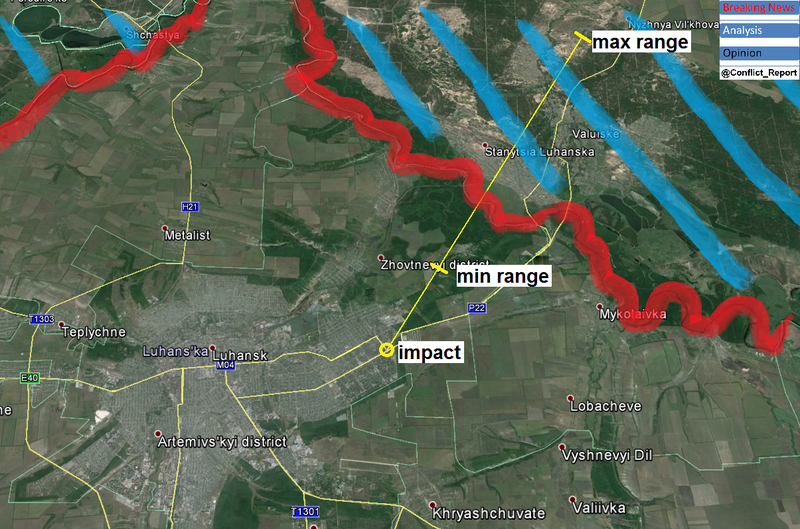 At exactly 19:00 local time (20:00 Moscow / “LC” time”), a massive Grad attack was launched on the eastern quarters of Luhansk, having a radius of more than 2 km. Analysts (among them a source of mine) counted 60 impacts within 20 seconds across the area, meaning “one and a half” full BM-21 Grad missile systems were emptied on civilians in the city of Luhansk. 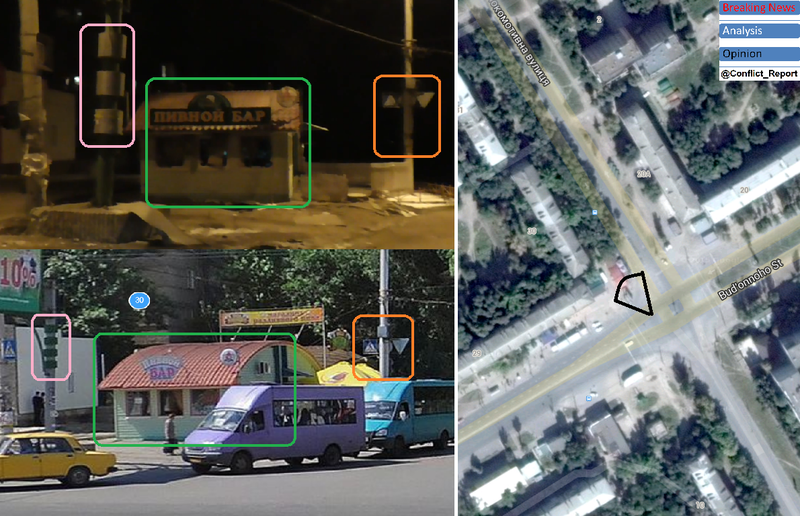 The missiles did not only hit residential buildings to the north east of the camera position (there are 2 more worse quality videos of the attack) but also in the middle of a main road and electrical infrastructure leading to a total blackout in the area. The wide impact area and sheer quantity of missiles used shows, this attack was merely conducted to terrorize civilians especially against the backgrop that there are no known military targets in that area (different from other parts of Luhansk city). Only the fact that the missile attack happened at night led to a relatively small casualty number among civilians with 4 killed and 7 injured according to preliminary reports. 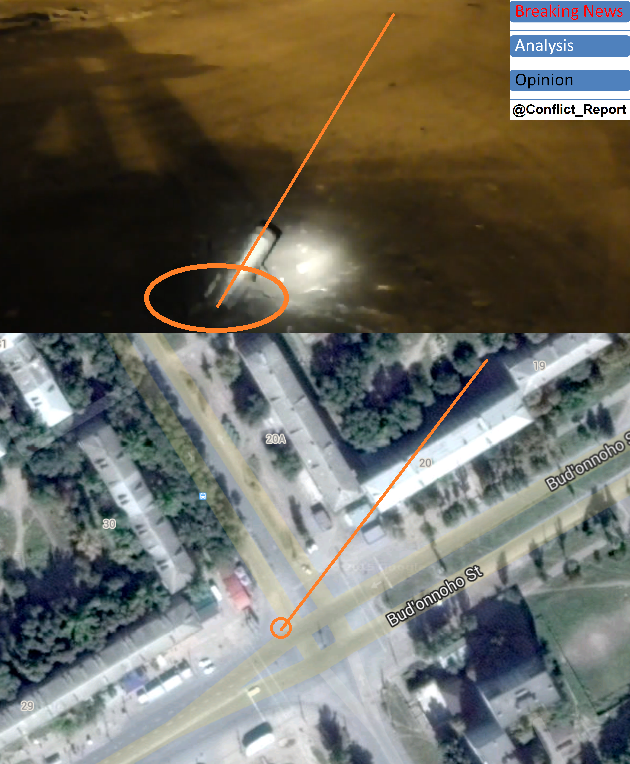 The obligatory geolocation and analysis of the attack prove the Russian invasion command kept all its promises about the heinous attack. (Graphic!) footage of the direct aftermath of the attack made it possible. Step one: Identifying an impact location. Step two: Determining the impact angle of the used Grad missiles. Step three: Taking into account missile range and territorial possessions around the attacked area. The analysis shows, not only the Russian forecast of the time but also of the direction of the attack was correct. 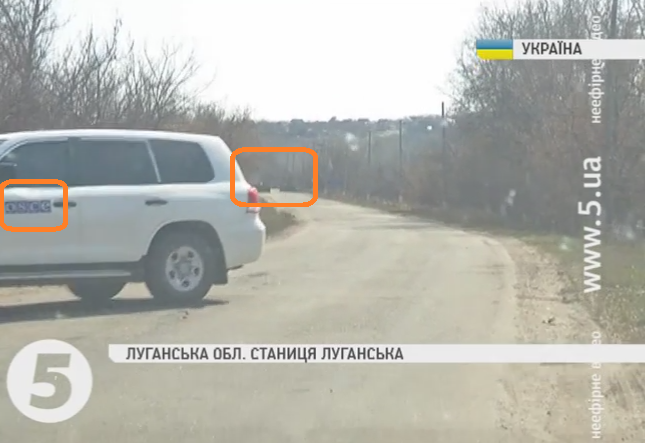 The attack happened from direction of Stanitsa Luhanska and certainly within the possible 3 km “window of opportunity” inside occupied Zhovtnevyi district. After all, we have warned that after 20:00 the firing will start !!!! In conclusion, this is another inhuman act by the Russian invasion command to incite the local population, blame the Ukrainian army for IT’S crimes and create another pretext to prolong the war, an approach, barely surpassable in its malice. Today on the 4th of January 2015, we are 27 days into the Ukrainian government’s latest initiative of the “silent mode” – the latest additional appeasement measure after the “Minsk agreement” from September last year. Still, there is no visible let up in Russian attacks on the front line all across occupied Donbas, reaching from southern Mariupol until Stanitsia Luhanska on the north eastern end of the new de facto border between Russia and Ukraine. The number of daily Russian attacks on Ukrainian held towns and military positions slightly decreased from approximately 40-50 a day to now 20-30, however this is rather due to the fact that Russian forces now decide when and where to hit, being able to concentrate their forces on the target areas, not being afraid anymore of Ukrainian counterattacks or even return fire after their assaults. 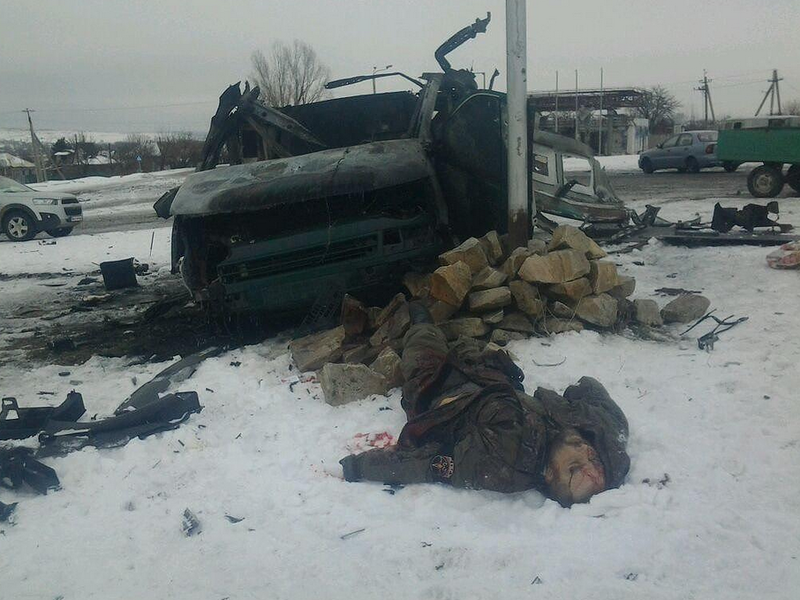 Just during the first 4 days of 2015, Ukraine saw 2 civilians and 1 soldier killed in fighting, while at least 7 civilians and 12 more Ukrainian troops were injured. 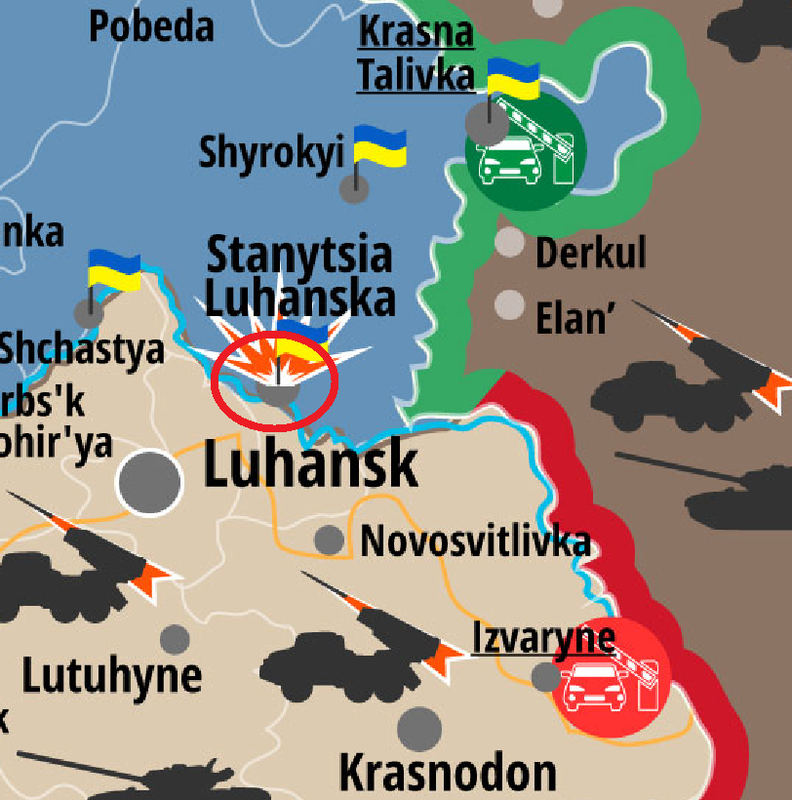 Hot spots of the fighting remain the same as before December 9, meaning the Bakhmutka highway in northern Luhansk province with its Ukrainian strongholds Krymske, Zolote and Hirske being targeted daily, the town of Stanitsia Luhanska on the (old) Ukrainian-Russian border and Popasna, opposite Pervomaisk. Yes, the number of Grad missile attacks decreased, but more direct artillery, mortar and small arms encounters remain a daily appearance with civilians as well as Ukrainian armed forces casualties. In Donetsk region, the airport of Donetsk city as well as its bridgeheads in Pisky, Opytne and partly Avdeevka are subject to daily shelling and fire attacks, while it remains unclear, if Terminal 1 of Donetsk airport is still accessible via Ukrainian.held territory or the two allowed resupply routes via Russian-held territory signal an even worse situation. It is chilling that Ukrainian troops at the airport – the so called “Cyborgs” – claim, they were not rotated and resupplied with arms and ammunition since more than 8 weeks. 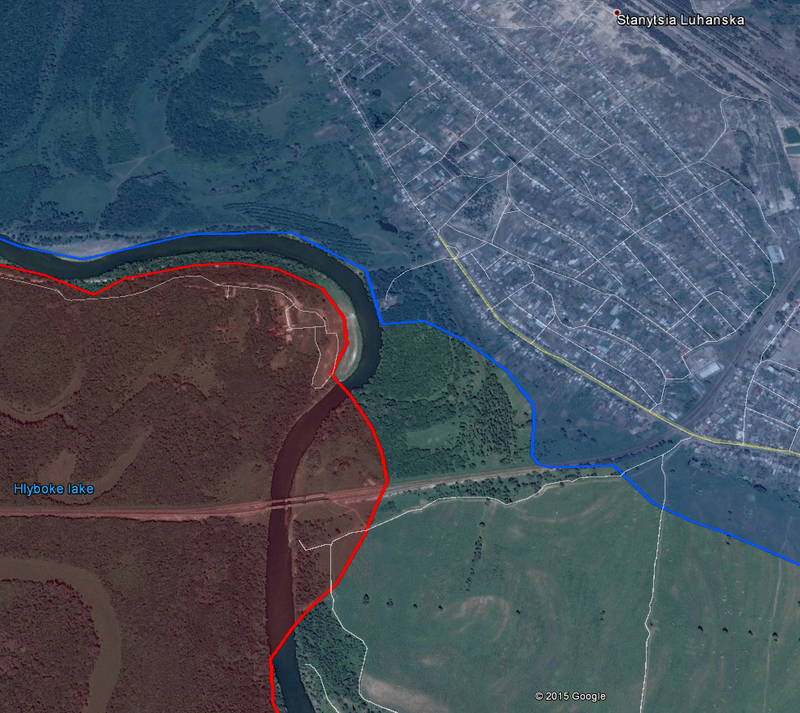 A rather new development in terms of Russian attack focus areas stretches along the Kalmius river, north of Mariupol. 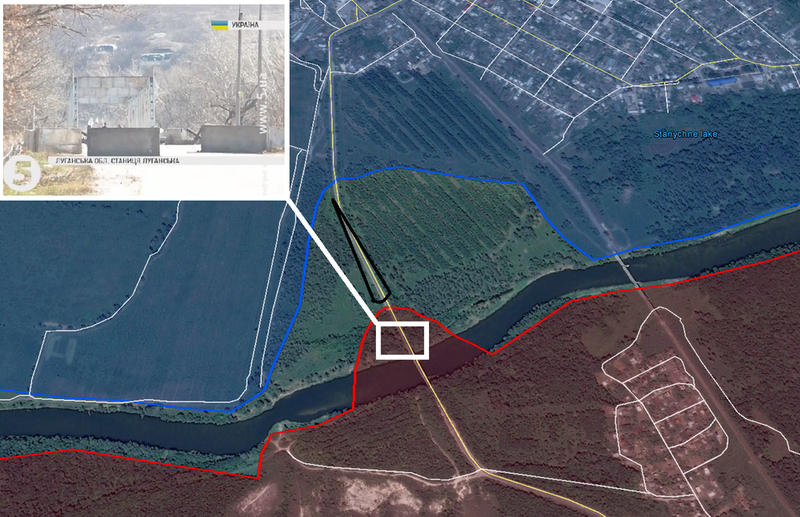 This river is the official demarcation line, agreed on by all parties in the Minsk memorandum. However, as we know Russian forces and their local proxies do not accept their own signatures under the paper, it is not astonishing they are willing to extend their area of control beyond that natural border. Thus, attacks started on January 1st with all sorts of weapons, even face to face encounters, trying to push back Ukrainian forces – mainly from the Regiment Azov national guard – and build bridgeheads on the left side of the river. 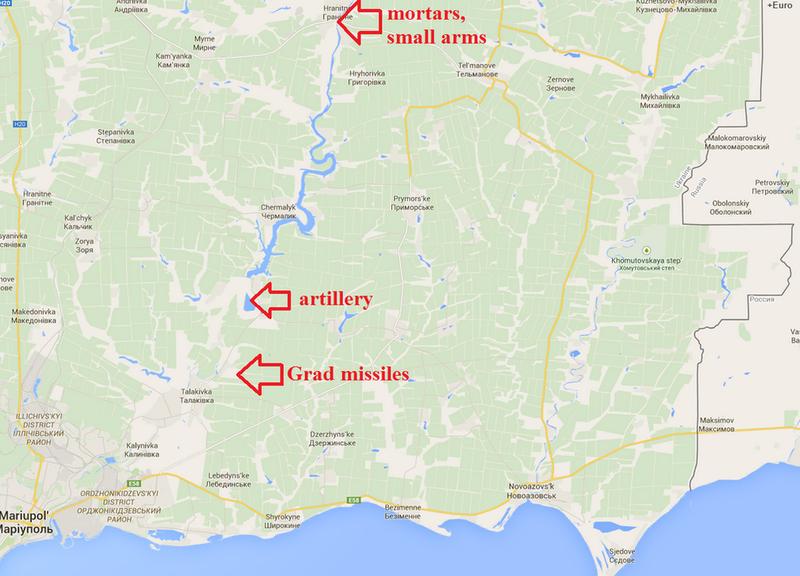 Between January 2 and 4, Orlivske, Hnutove and Hranitne came under attack from Russian forces. Beyond concrete attacks on the Ukrainian line of defense, multiple other worrying developments were recorded, mainly a – partly violent – replacement of Russian “volunteer” (former army) mercenaries with more Moscow-loyal forces, accepting the high command from the Kremlin and behaving less “wild” on Ukrainian ground. 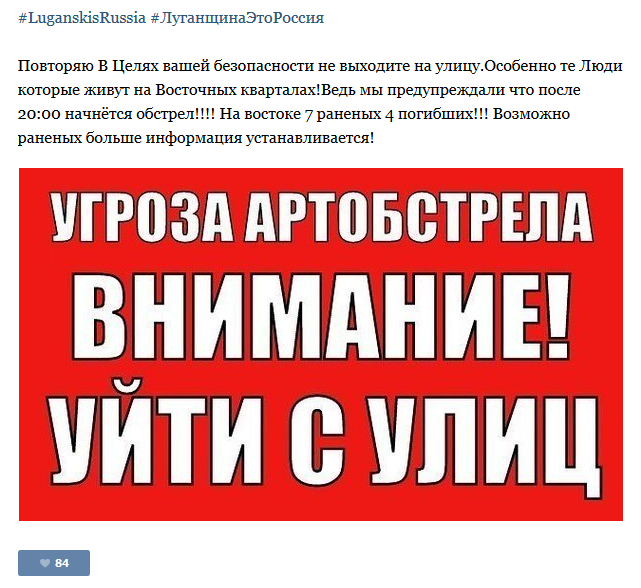 Despite only little facts available, it seems those Russian invaders, trying to build a “New Russia” – “Novorossiya” – are fought and replaced by the more “legitimate” pro-Moscow regimes, namely the “People’s Republics of Donetsk and Luhansk”. While one Russian ringleader, called “Batman”, was killed by LC regime forces, others of his group swore to fight both, the local regimes as well as the Ukrainian army from now on. Ukrainian reports say up to 23 militants from both sides were killed in recent infighting, seemingly supported by aftermath pictures. While those, not behaving like Moscow wants it, are sent back to Russia or – if not willing to – obliterated without mercy, those, who obey to the Kremlin leaders’ will are rewarded with the latest Russian army military hardware, namely the BPM-97 “Vystrel”. Those apc, only produced in Russia and only used by Russian border troops, are the latest hint that the very leadership of the Russian Federation has nothing in mind that could equal any kind of retraction from its offensive position in Ukraine. At the same time, it becomes once more explicit that Russia – just like with its T-72B1 or T-72B3 – would never give its latest armored personal carriers to any “rebel” faction in some renegade region abroad, but would only allow a free “export” of its 2000s hardware with qualified and loyal – Russian Army – personal. That this personal is active as never before in Ukraine can on the one hand be recognized by multiple reports: Even the Ukrainian NSDC, which has a long history of downplaying Russian involvement in the conflict, fearing a cut off from international funds, said on January 3 that hundreds of Russian Federation troops entered Ukraine lately. 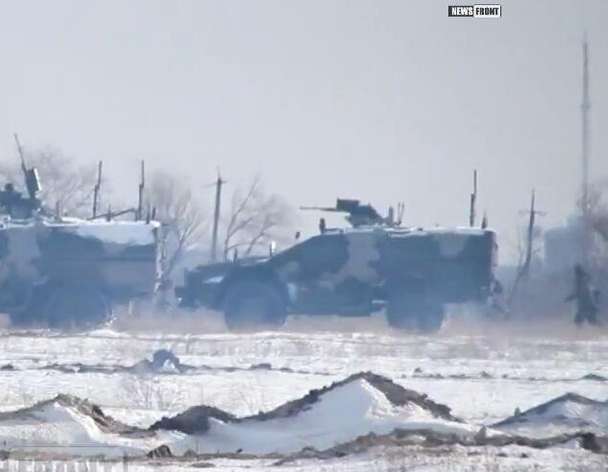 Other reports from local witnesses and media reported for instance that 300 Russian soldiers had taken over Horlivka at the frontline with Ukraine, sending “DNR” forces to the hinterland. 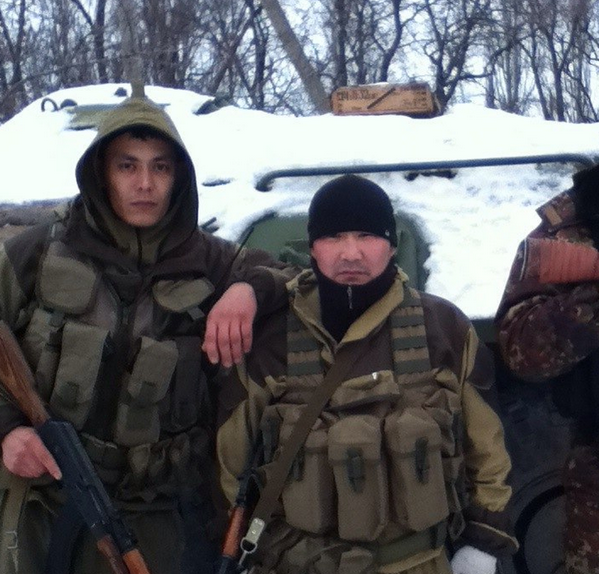 On the other hand, more and more evidence turns up that Russian soldiers from the Far East, seen approaching from Ulan Ude and elsewhere in November, are now fighting in Donbas, like in Horlivka as mentioned above. Last but not least, the Russian army (ab)used the Ukrainian “silence mode” to build up a working military logistic and infrastructure network in Donbas, now being able to (at least for a while) repulse any kind of military attack from the Ukrainian mainland. Part of this network are air defense systems and backup bases in Donbas hinterland (10km or more from the front line), like this base with dozens of BMP-1 in a former public transport depot, recently recovered and geolocated by me in Krasnyi-Luch. In conclusion, there is no indication at all of Russia or its two local puppet regimes, having any intention to stick to the signed Minsk agreement. Hence, there is no sign on the horizon that the Ukrainian president’s peace plan, ceasefire or “silent mode” were anything close to be working in Ukraine’s favor. Therefor it is up to the Ukrainian government to chose if it wants to further stand idle and watch how a powerful Russian invasion force is taking shape on Ukrainian soil, able to hit hard when it where it chooses — OR if it wants to regain the initiative in the conflict by not allowing militants to strike at will and unpunished, killing Ukrainian citizens and soldiers and – slowly but steadily – expanding their controlled territory inside Ukraine and further shrinking a young, but proud and – if willing – also punchy European nation. Did you have a good read?! Please support my work with 1$ per month or more!